Over the weekend, Saturday to be precise, my brother challenged me to 30 days of "water only drinks". That means for me, no morning coffees before my first lectures, no green smoothies (however I can still have green nicecream and smoothie /bowls/. I just can't enjoy consuming it out of a cup/straw), no hot mugs of tea and no protein shakes/pre-workout. My goal also is to always drink at least 2L of water. I usually do but there are some days where i'm just like "nope, not today". This is day 3 of that challenge. I'm hoping to lose a little body fat (lose that gut that I developed from all those animal by-product treats) and to have overall mental clarity and clearer skin. I performed the 21 and 9 thrusters without rest but I had to break the 15 into two sets of 8 and 7. Overall i'm happy with my results. If this was me one month ago, I would probably not have finished that workout in 17 minutes! I still need to work on my 400m runs though. Today I felt like dressing like someone who isn't a slob. Sometimes I feel like I want to get into OOTD and fashion and all that jazz but then I remembered that I have no sense of fashion and i'm not very photogenic... Anyways i'm quite into dresses with a jumper over the top and my heeled boots at the moment. I woke up at 5.15AM due to my alarm but I didn't get out of bed. It was then that I decided to skip my two lectures (9-11AM). I figured that the 2-hour travel time is not worth the 2 hours of lecture time? Maybe... I'll see how productive I am today. If I find that procrastination was overpowering in today's stay at home then i'll definitely be at uni on Tuesdays. The workout intended for three rounds of the last two movements but I took a really long time on my snatches. I'd be doing them one at a time and for the last few reps, I pushed out two sets of 3. Anything that requires the bar to go over my head is mentally hard. For this week I've been having overnight oats for breakfast. It's not messy, doesn't require heating and is absolutely delicious! Every time people tell me that they hate oats or that they tried a recipe and it was gross, I always respond with "maybe you just made it wrong". 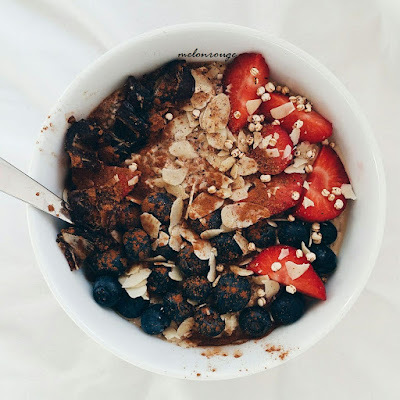 Here's an idea of how to start with the ratios (everyone's ratios are different) - My basic easy-as-ABC overnight oats recipe! A handful or two of fruits, nuts, seeds, anything you want really! Okay here's the hardest part... Find a jar, mix everything together and store it in the fridge. In the morning, you just grab it and go go go! Or if you're staying at home, you can eat it right from the jar or pour it in to a bowl and turn it in to an insta-worthy shot (don't take reference to the above image... it's far from insta-worthy as i've just chucked everything on top - but i'll still probably post it haha).